Saint Laurent is a fashion house that symbolizes class and style and creates modern classics that stay relevant for years. In the bag universe the brand has had a lot a lot of success with its older models like Muse, Muse 2 and Roady that stayed popular for years, and it is still very much desirable by women all over the world with new classic best-sellers - Sac De Jour, College, Classic Monogram Crossbody and Sunset - to name a few. However, Saint Laurent is not willing to rest on its laurels, and every season reinterprets popular silhouettes, keeping the excitement for beloved models high. Let’s start with the Sac De Jour. A bag that gained world-wide success as a simple and sleek tote that is very practical and versatile. It was introduced in 2013 by Hedi Slimane and was inspired by Hermes’s Birkin bag. Over a year ago the brand updated the bag by ditching off suede interior and replacing it with leather and making the middle zipped compartment (pouch) removable. For those who love the simple silhouette but prefer a more slouchy look, in 2017 Saint Laurent offered the Souple version that just like its older sibling, has a clochette with keys and a lock, an adjustable removable strap, but has visible studs on its belt straps and an extra tag with metallic plaque on it. Another way to breathe a new life into a popular model is to play with finishes, colors and embellishment. A good example is the Rive Gauche Cabas. Very sleek, simple, and elegant in its design, this bag got an upgrade in 2016 and while still remaining a familiar structured and minimalist look, it now becomes an eye-catching piece due to color blocking. Classic Monogram Crossbody has got to be one of the most popular bags in the last few years. Embraced by bloggers and fashion lovers alike for its versatility, it can be worn as a shoulder bag or a crossbody, comes in small and medium sizes and in different materials and finishes. The Classic Monogram line was launched in 2013 by Hedi Slimane and was inspired by graphic designer Cassandre that created the brand’s logo of three intertwined initials in 1961. To elevate the versatile crossbody to another level, design team decided to focus on embellishment, offering heart-shaped studded leather version of the bag, and later on an evening crossbody with star-, moon- and heart-shaped studs, crystals and a patent bow on a flap for those who want to add an extra glamorous touch to their look. The latest hit that is gaining its momentum is the Sunset Bag that was introduced in November 2016, under creative direction of Anthony Vacarello. It is a perfect day to night bag with two roomy compartments, a front pocket, and a leather clochette. Initially offered only in solid color leathers and crocodile embossed leather, the new variations expand the choices with addition of glitter material, calf hair, quilted leather, and many more. A recent version has a heart-shaped suede detail with bordering studs. 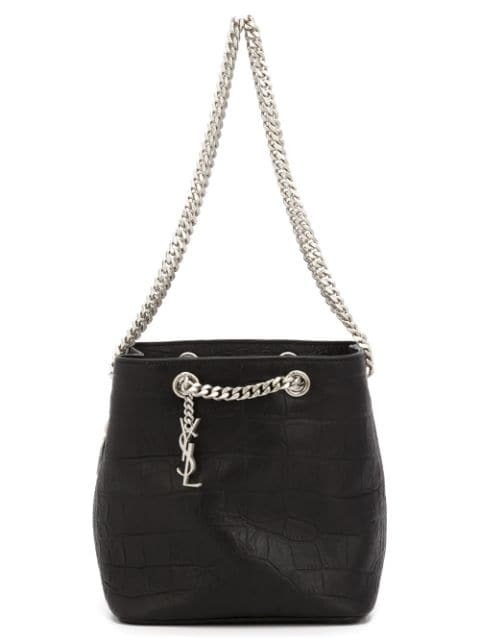 This bag is a perfect mix of fashionable, edgy, and feminine. Another fashion-conscious buyers’ favorite is Emmanuelle bucket bag. It was spotted on the crème de la crème of the fashion industry, like Vogue editors Anna Dello Russo and Emmanuelle Alt. At first Saint Laurent introduced the chain version of this chic and carefree bag, turning a convertible bucket bag into a shoulder bag and then went further with decoration and added floral appliques. This transformed a casual, easy to wear piece into a dream bag for women with a girly and romantic personal style. Regardless of what your personal style is, it won’t be a difficult task to find something that fits you, as Saint Laurent keeps on transforming elegant and timeless bags. We are excited to see what the creative team has to offer for upcoming seasons. Are you?